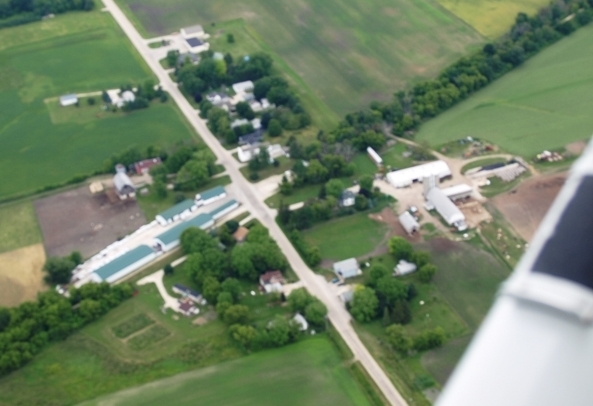 You can see the Town Hall at the top of the picture , Wisconsin Building Supply is the buildings with the green roofs, and the line of trees running from the top right to the bottom left is the Wild Goose State Recreation Trail, the 2 farms are Lance Kintzler’s and the rest are residential houses. The unincorporated village is located on Oak Center Road. The community once contained two taverns, a dance hall with a cheese factory and town hall, a store with a post office and bank, a lumber yard with a stock yard, beet dump, and feed mill, a machinery repair shop and a train depot. The only business remaining is Wisconsin Building Supply which has been modernized and is a thriving business. The Town Hall, garage and salt shed are located on the north end of the community of about 17 residential houses. The abandoned railroad has been replaced by the Wild Goose State Trail. The community is served by the Oak Center Sanitary District but each home has their own well.